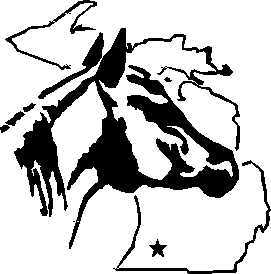 Michigan Association of Western Horse Clubs was established in 1946 to encourage and promote the interests of individual clubs and individual members in better horsemanship, showmanship and sportsmanship. Our emphasis is on having fun while we acheive these goals. We are a non-profit organization and our family oriented club and our open shows have something for the whole family. For information about the club and membership check out our other pages. Would you like a copy of our rulebook? You can download a copy of it on the Michigan Association of Western Clubs page. The 2009 Point Totals are now posted on the MAWHC Point Standings webpage. Would you like to purchase an ad for your business or may be a good luck ad from MAWHC? We will publish it in our show booklet and on this website. Go to the Good Luck Ad page to find the form. CHECK OUT THE UPCOMING EVENTS PAGE FOR THE TIMES AND PLACES OF OUR HORSE SHOWS. YOU DO NOT NEED TO BE A MEMBER TO ATTEND AND PARTICIPATE.